If your stereo or video system has a hum or buzz coming from the loudspeakers, there are several easy steps you can take to discover what the cause and cure will be. Once you’ve identified which type of hum it is, the next three steps are to narrow down where the hum is coming from. Turn the volume control up and down. Does the hum in your speakers go up and down with volume? Take note so we can come back to this answer. Does the hum go away? Is it only audible with one input selected, or all of them? Remove the cables connecting the receiver, power amplifier, or device powering your speakers. Only the speaker cables, loudspeakers, and AC plug powering the unit should now be connected. Does the hum go away? If the answers are yes to questions one and two, it’s likely that one of your sources (like a CD player, turntable, video feed), is the source of hum. Remove that piece from the receiver, amplifier, or integrated and the system hum should now be gone. Once determined you can either replace that piece of gear or read our extended hum fixing guide for further instructions. If steps 1 and 2 were “no”, but removing all inputs eliminates the hum, it is likely you have what is called a ground loop. Ground loops are common when video equipment is connected. In particular, a cable TV connection. Reconnect each source again, one at a time and listen for the hum to return. The offending piece of equipment will show itself when you follow this procedure. If the hum is caused from the cable TV connection, you can ask your cable company for an isolating transformer for the cable. You can also purchase a cable TV isolation transformers at most stores, or online here. They look like this. If it is not a cable TV causing the problem, it may mean there’s a power ground loop between the two pieces of equipment. You can test for this by using an AC “cheater plug” that lifts the third wire ground from the AC receptacle. If this is the case, you can purchase a HUM X ground isolator that is safe and effective. These are available here. It is not recommended to run your equipment ungrounded, for safety reasons. FINALLY!! thank you, thank you. I had a humming noise coming from my TV speakers for a while, well really a long while. I have watched several videos and all a so complicated fix. Your clue of a bad connection, ground problem made me change the video and audio (the red, white and yellow cables) connections from my cable box to TV and….WHALA! no noise. Thank you so much for taking the time in shearing your knowledge. Wow what a difference. Again thank you so much. Yes. Use an isolation transformer for the antenna and it should solve your problem. Disconnect everything from the amplifier so that only the speakers remain – no input cables at all. Does it still hum? If the amp/receiver is the problem, then will a ground loop isolator not work as a fix? The amp, without anything plugged in, still creates a hum (sort of like an auto filter sound *thup thup thup thup thup) in both speakers, unaffected by volume control. Is the only solution to get the amp looked at or might a ground loop isolator between the amp and the speakers work? Thanks! Sounds like the amp has a problem a ground loop isolator won’t fix. The ground loop isolators are effective only by lowering interactions between equipment and uneven grounds. If a piece of gear struggles on its own it’s time for the repair shop. Sir. My name is Indrajit. I live in New Delhi, India. I have a newly bought Schiit Magni 3 and a Fiio X5III DAC. I currently face an issue of humming that is only audible when the headphone is connected with the Magni 3. The humming is also audible through headphone after disconnecting the dual RCA cable from the amplifier. There is no external humming audible through the amplifier after disconnecting the headphone. Humming only happens when headphone is connected with or without the RCA cable. And the humming occurs and stops sporadically. Sometimes there is hum, sometimes there isn’t. I guess it is a 60Hz hum. I have tried removing all electronic devices away from the amplifier but the humming still occurs. Once the hum occurs, restarting the device also doesn’t help as it goes away only when it has to go away. The house where I live has voltage fluctuations. Outside of that I am unable to identify whether it is the amplifier itself that is flawed or the grounding in the house. May I ask your insight on this problem. Could it be a grounding issue or is the amplifier itself? I have a slightly different situation. An older McIntosh MA6100 integrated amplifier. It was serviced in the past year and recently and with variability I’ve noticed that if I put my ear to the right speaker, I am picking up some FM broadcasts. I don’t even have a tuner plugged into the integrated. It is running to another Mcintosh amplifier and I am using the 6100 as a preamp. The other amplifier, when the preamp is not turned on is dead quiet in the speakers so the 6100 appears to be the source. The 6100 only has a 2-prong plug on it. I haven’t tried plugging that into a 3 prong converter and into the power source (an adcom power conditioner). What are your thoughts? It’s only in the right channel and the left channel is not producing this sound. Any guidance you could give is greatly appreciated! Happy New Year! It’s rare to see a company doing what I can best describe as a public service – congratulations! I also have a speaker plagued by hum – an active speaker (a Focal Solo6 Be). Only the right speaker has the problem, and it has it all the time, even when the XLR cable is removed – no changes when the volume is turned up or down, and no influence when I change the input. After I read your article, I physically removed the speaker from the current set-up, plugged just the power cord into a dedicated outlet (i.e. an outlet which was only serving this active speaker), and the hum was still there – please note that there was no XLR cable involved in this set-up. The hum can best be described like a faint diesel engine: doo boo, doo boo, doo boo, etc with white noise instead of a doo or a boo. Alternatively I can describe it as white noise (hiss) that happens 3 to 5 times a second. 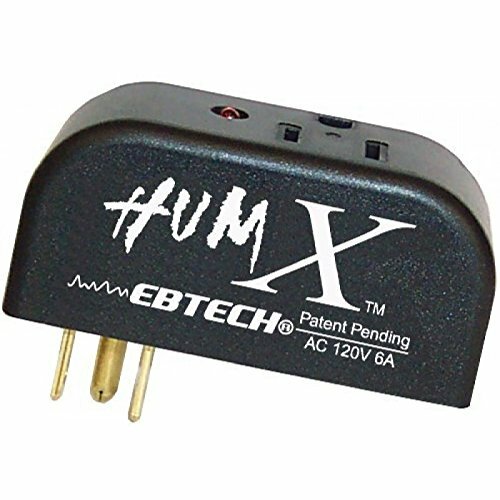 Should I try the HUM X? Or should I take the speaker to be serviced? It sounds to me like the speaker itself has a problem. I would get it serviced. Good luck! I have a laptop and 2.1 speaker system both without ground wire but whenever I plug the speaker system to the laptop while the laptop is connected to the wall, I get humming speakers. It works just fine when the laptop is unplugged and running in battery. I tried different wall plug but no avail. Can you help me ? Here’s a great example of when to use a 3-prong to 2-prong AC cheater plug on the laptop. What are the power plugs on the back of amplifiers used for? I notice they are NOT grounded (3 prong). Also, if the hum is indeed coming from the amp, is it typically the same source? Bad caps for instance? I have a Plinius SA-100 MK III power amp plugged directly into the wall with an Audience Power Chord. I have a Plinius 12P preamp connected to the SA-100 with Audience Au24 Balanced XLR’s. The preamp is plugged in to a Monster power strip with ground, with a “regular” power cord. The only device plugged into the preamp is a Naim NDX DAC/streamer, with Morrow RCA cables, and a Morrow power cable into the Monster power strip. Incidentally, the Plinius gear has been totally reconditioned and upgraded with all new capacitors, etc. For two months in the new house, the system has worked flawlessly. After not using it for a few days, I turned it on and a huge hum was coming from the speakers. Nothing has changed in the house during that time. If I mute the preamp or turn it off, no hum. The hum is present if I switch inputs, or have nothing plugged in. I have tried plugging everything into the power strip, plugging the strip and the amp into the same outlet, plugging them into different outlets, turning off the Naim, nothing stops the hum. What can I do? I read that an isolation transformer will fix audio hum, but have also read that it cleans up dirty power but not ground loops. I have tried the floating ground on both the preamp and power amp but nothing works. Please help me, Obi-Wan Kenobi, you’re my only hope! It sounds to me like there’s something wrong with your preamp. Follow the steps in our guide which are basically a process of elimination. Start with the amp connected to the speakers but with no input cables connected to the preamp. Let’s assume no hum. Connect the preamp this time making sure the preamp hasn’t any source connected to it at all (mute doesn’t count). From what you said there would be hum. If not, keep going and add a source. If the preamp has a low, deep, hum (not a buzz) just connected to the amp with no input then it’s likely it’s a problem preamp and needs repair. As for the “tone” of the hum, my best unscientific guess is that the hum is in the 90-120 hertz range. It is a little like the hum that you might hear near one of those large transformer power stations, but obviously much louder. I would hate to have to pack my preamp up and send it for repair, only to find out that there was something else outside of the preamp that I should have done, like an isolation transformer or the humX. Is there anything else I should try before calling it and sending it to the hospital? Let me know which of these more closely resembles yours. Paul, although I was unable to get the samples to play, probably due to various script and ad blockers that I have running, I listened to some samples on YouTube and the hum is definitely closer to the 120hz sound than the 60 hz sound . . .
That sure sounds like a ground loop then. So, the preamp and amp together hum if nothing is plugged in or touching the preamp but the amp? And this didn’t happen before? Are you certain? Hi Paul i broke out my vintage Yamaha RX-995 receiver and Yamaha yp-701 turntable. I’m getting a lot of feedback from my turntable thru the speakers. I can just tap the turntable base and hear it thru the speaker or whenever the arm moves i get loud feedback. I do have the tt ground connected to the receiver. I have moved the tt to a different location and plugged the power into different outlets. and no help. Do you concur that i probably have a mag. cart. connection that’s bad (shure type V15-III), a bad ground or bad cable from the tt? Any help would be appreciated. This sounds more like an acoustic problem than an electric one. I am guessing you’re in need of a new table? Hi Paul, I had an issue with my Kenwood series 21,its a vintage system about 20 years old. It developed a hum on all inputs. After unpugging everything from the control centre it was the graphic equaliser at fault. I swapped it for another one I have as spare and the hum is gone. However graphic equalisers for this system are quite rare and I want to keep it in case of problems in the future, what I want to know is does the G.E need to be looked at by a specialist or will fitting an RCA ground loop isolator to the G.E outputs resolve the issue. Buy the way I’m in the U.K so running at 220 volts 50 Hz if that’s relevant. Good question and I am not sure of the answer. If you listen to the two example tones is it closer to the high frequency one or the lower frequency? If the latter then likely you need a new set of power supply capos, if the former, it might be solved with ground loop isolation. It was closer to the 120Hz hum given that I cant hear the 60Hz one either on here or as a test signal on a couple of you tube channels though it was of a lower frequency than the one at the top of the page. Not sure if its relevant but the G.E with the hum is a recent acquisition ( last 2 weeks ), I changed it out for the G.E I already had to make sure everything was working fine, which it was. On Friday last week I changed the single tape deck for the optional twin tape deck which I had acquired as brand new old stock from Italy ( same voltage same frequency as UK ) and changed the plug to a UK one. The hum started about 2 days later, the G.E is an optional extra and connects via the tape inputs in the receiver the tape deck then connects through the G.E in that configuration. Howdy. Just recently upgraded my A/V receiver. I use the pre-outs to power my front speakers. I get a hum from them in every situation I’ve tried so far. I think I’ve found the problem but want to double check before I call the cable company or have to buy a fix. When I disconnect the coax cable coming into the house (Comcast) the hum disappears. I’m assuming that I need an isolating transformer for that cable connection. Is that correct? Thanks in advance! That is correct. An isolating CATV connector will do the trick. Good detective work! I have a similiar issue. It is when I add a rca over cat5 balun between an amp and a preamp. The preamp is a nuvo grand concerto to a nuvo 2 channel amp. Even if I have the 2 pieces of equipment connected with a very short cat5 or a long one like in the wall I get a very loud hum. If I connect via rca no hum. As soon as the cat5 and balun is introduced hum. I tried different cat5 lengths cause I thought it was the inwall wiring too long or bad. Same hum. Tonight I connected a solid copper from the amp to the preamp using screws on the chassis and the hum decreased but it is still there. If I stand 5 feet Tom the speaker I hear it with the volume all the way down. If I turn the vol up I obviously don’t hear it. But with speaker vol all the way down it’s coming from the speaker. So again only when the balun and cat5 are introduced it it there and copper ground to amp and preamp decrease it but not completely. Hi, First off, Thank you for this informative thread, it is appreciated. I am having an incredibly challenging time with hum in my home stereo system. Worth noting is that the hum I am experiencing sounds like a combination of both hum sound samples you have available here. Audio Research VT 60 tube amp. I get a hum through the speakers when either of the two pre amps are connected to the Main Power Amp. If I disconnect the Pre Amp, the hum goes away. I have tried removing each piece of hardware from the pre Amp (i.e. cd player, turntable, etc.) to see if a particular unit was the cause of the hum, but it is not. The moment I connect the pre amp to the power amp, I get the hum. Also, the pre amp does not have to be plugged into a power outlet for the hum to start. Regardless of the pre amp being plugged into the power outlet, the moment it is connected to the power amp, the hum starts. I have tried the ground loop device suggested in this thread to no avail. I have also tried different interconnects, but this has had no effect. I look forward to your suggestions, as I have tried everything I can think of. Thank you. Hi Adam01, I have exactly the same issue as you. Did you fix the problem? So I’ve isolated the source of my hum to be the cable (no surprise there). I tried the suggested cable TV isolation transformer as suggested but it did not work. The only coax I could connect it to was the cable in on the cable box. My cable audio out is connected via RCA plugs to a Sonos Connect which then feeds outdoor speakers. When I disconnect the RCA the hum goes away. When I reconnect it, it is back. Is there something I can put in-line with the RCA connection that will pull out the hum? You can ultimately resort to something like this: https://www.amazon.com/XtremPro-Hi-end-Ground-Isolator-High-fidelity/dp/B01A56CMUO/ which will fix the hum and if you’re using a Sonos as the audio source shouldn’t harm the sound. Thanks for this how to note. I recently received a new S300 amp and had a hum issue and spent the better part of the day unplugging and plugging together my system – very frustrating. A few times I thought I had isolated the problem but then it reappeared. I finally located the source as a Dish Joey satellite TV connection to my pre/pro. I swapped out the Joey power supply and HDMI cable with ones from another room but still had the hum. I then moved the HMDI connection from HDMI 1 to HDMI 2 on my pre/pro and the hum stopped. So far no hum since last night. I mistakenly thought the problem was with the new analog audio cable since I had just added the S300 and focused on them before checking the HDMI connections. Good you found it and sorry for the problem. Let us know if you need any help. I have a hum problem with my phono stage. There is some hum on 50 and 100 Hz (I am located in Europe) I simply cannot get rid of. It is low in level, but still audible when I lift the cart needle from the record. The hum is there even with no input connected on the phono stage, so it is not a turnable issue. It is there even with no preamp connected to its output! I know because I have recorded the signal using its built is USB port , connected to my laptop. I have tried all combinations, phono+preamp+power amp, phono+preamp+headphones on preamp, phono directly connected to power amp, I have used balanced and unbalanced cables to no avail. I even covered the ground contact of the schuko plug with electric tape as s cheat plug, no luck. It goes without saying that I have swapped all cables in case I has a cable problem. The funny thing is that when I take the same phono stage to a friend’s home, or to the distributors shop there is no hum whatsoever. Could this be a power line issue? How can I try fixing this? If you’ve truly performed all the steps in this guide and there’s still hum with the unit unconnected as you described then the unit itself has hum internally. This can be from a poorly shielded power transformer or just a poor design. If it is actually the frequency you suggest it is and inside is a toroidal power transformer, sometimes you can rotate the power transformer to quiet the hum. Loosen the hold down bolt for the power transformer and, with the unit on and connected to speakers so you can hear the hum (nothing else connected to the phono preamp) rotate the transformer and see if that helps. Thank you for the suggestion Paul! Unfortunately there is no toroidal transformer in it. There are two power modules. The one is 40 Watts Traco Power TML 40251 C putting out +15VDC at 1333mA and -15VDC at 1333mA and the other one is a 20Watts similar module putting out +15VDC at 667mA and -15VDC at 667mA. Looking at the spectrum analysis with zero input ,the S/N ratio is at around -73dB from 6Hz to 37Hz. Then is jumps up to -50dB at 50Hz, again down to -72dB at 60Hz, -83dB at 87Hz, up to -70dB at 100Hz and then spiking -63dB at 150Hz, -69dB at 250Hz and smaller spikes up to 700 Hz. Do you thing I should sent it to the manufacturer for service, or is it something connected to the power company feed which I could tackle with one of your products? This is not a cheap phono stage, it is a Leema Agena costing around 5.000 Euros our side of the Atlantic and it is difficult to convince the manufacturer that there is a problem with it because in other houses there is no hum whatsoever! Hi Paul – wonder if you could help me… I recently purchased a Feliks Expressivo Mk II headphone tube amp – very nice piece of work. This is my first foray into tube rolling, and I do believe that I have that dreaded 60Hz hum. I first noticed the hum with a pair of Mullard E188C tubes – it was very apparent. I’m at my wits end. Is hum something I need to live with? Do I give up on the Feliks amp? From your description, it sounds like the hum is intrinsic to the little amplifier. That’s not something you’ll likely be able to fix with these tricks because it’s part of the design of the little amp. I can see by the picture of the model you have there’s a toroidal transformer in the rear and on top of the unit. It’s likely that the source of the hum and different tubes pick it up differently. If you can figure out how to get that metal cover off the transformer you might be able to rotate the toroid for lowest hum. Toroidal transformers have asymmetrical field radiation and you can rotate them while listening and find the point of lowest hum. It’s what we have to do in each of our phono preamplifiers to get the lowest hum. Your diagnosis does make sense as the hum is most noticeable in the English Mullard tubes with the Russian Electro Harmonix with least amount of hum. The Mullard tubes may be more susceptible to transformer ‘noise’. This is interesting – I’ll let you know what happens! I see myself building a Faraday cage…. The humming I get (60hz hum, from the speakers) increase / decrease in strength when I adjust volume, and goes away completely for some of the different inputs. Humming does however not disappear when I disconnect all inputs. I’ve connected my Denon 484 to an outlet on different circuit from everything else, humming persists. Does this indicate an issue with the receiver itself? I pressed the CD player. Anywhere or pressed it or when I touched the metal leads on the monster cable, the hum sound got much louder. Any suggestions? I haven’t replaced the cables as yet and they are about 30 years old. I also noticed that above port where I plug in the monster cable, there is a place for a grounding. What should I put there, if anything. This is the second CD player I attached to my amp/receiver. I had the same results. My TV, blue ray player, and indoor HD antennae are all in the same vicinity. I don’t think they should interfere. What are your thoughts? A surge protector isn’t going to offer you any benefits for hum reduction. It sounds like your equipment is not properly grounded. It may also be your television connection. Take a look again at the step by step instructions on this page and using one piece of gear at a time, see which one is causing the hum. Thanks for your suggestions. I read through the instructions again and tried what was suggested, but I was not able to remedy the problem. 1. I have an amplifier/receiver which is connected via monster cables to a new CD player and new speakers. No other components are connected. 2. My TV, air antenna and Blue Ray player are in close proximity to the above set up but not connected to them. 3. My speakers sound good when I listen to the FM radio as there is no hum and the sound quality is excellent. 4. However, when I switch to the CD mode on my amplifier/receiver, I hear a loud hum (60 hz sound). 5. When I press on the CD players surface or touch the metal portion of the monster cables, the hum sound gets louder. 5. I plugged the CD player into the wall directly and also into the amp/receiver and the hum sound continued. 6. I unplugged the CD player but allowed it to be connected to the amp/receiver via monster cables and the hum continued and was enhanced when I touched the CD player. 7. My speakers makes popping sounds when I play a CD. My amplifier/receiver is 28 years old. Could it be incompatible with the CD player? I checked the compatibility of the speakers and amp/receiver before I bought the speakers. There is a place to ground a wire above where I insert the monster cables on my amp/receiver. What should I place there, if anything. If you have the receiver and speakers connected but nothing else, including the CD player, then switch to the empty input where the CD player would go. Is there hum? Sounds like no. Then, connect the CD player and try again. It appears there is hum. If that is all true, then your receiver is probably ok. I would suspect the connecting cables between the CD play and the amplifier. Try replacing those with something else. If another set of cables still hum, then there’s likely something wrong with the CD player. Try another piece of equipment in the exact same input on the amplifier. If it too hums like the CD player, then it’s the amplifier. I have a huge problem with my speakers, and have brought in several experts but no solution in sight. I own a dance school, with two classrooms roughly 110 sq. meters each. In one class there are two large PA speakers (PreSonus) and in the other four (4) Studio Monitors. Both rooms have a high pitch sound /noise, but the one with 4 Studio Monitors is unbearable. Each Set of speakers is connected to a mixer, and the mixers are connected to laptops. I have tried removing the sources but the sound is still heard, and very annoying. An “expert” told me that nothing can be done, because PA speakers are not suitable for dance classrooms and I would be better off replacing and installing ceiling speakers. By the way, the speakers are 1 year old, brand new! I’m at my wits end with this issue. Another “expert” told me I could use special isolated cables but that that’s not worth it as they are extremely expensive (like 300 euros for 2 meter length). Could you please advise what I could do? Many thanks in advance. Let’s separate out the issues here. First, whoever told you that PA speakers won’t work for your dance studio should be ignored. That expert isn’t giving you good advice. PA speakers are exactly what you want. Next, if you remove the inputs to the speakers so that they only have their power cords plugged into the wall, what do you hear? If you still hear that screechy noise then there is something wrong with the speakers themselves and they should be returned and replaced. If they are quiet, then email me paul@psaudio.com and I’ll try and help you through the problem. My old Sony STR-DE685 receiver suddenly has developed a loud hum coming out of the speakers only on FM (it might be on AM also, but it never pulls in any AM stations so I can’t tell). I don’t believe it’s a ground loop or any other interference. The sound is fine for playing CDs or coming from the TV. But trying to listen to FM is impossible — the hum is so loud it’s overwhelming. It sounds like the FM ‘radio’ part of the receiver is shot. Is this what it sounds like to you? So what are my options? — replace the whole receiver with an old one of a similar type that takes RCA connectors, like maybe a Yamaha R-S202? Or are there some FM-only units out there on the market I can plug in? Greetings from a former Bouldarian, from Martian Acres, north of Table Mesa Rd. Hi Paul, I am getting 120Hz buzz when I hook my sub to my Acurus A250 using a Neutrik lead. The amp only has a right and left speaker output so I am using the Neutrik lead screwing down the wires as follows: yellow to left red, black to left black, and red to right red… leaving the right black alone. I am also then plugging in my speaker cables to the same outputs using banana type ends. When I disconnect the sub the buzz goes away so I know it has something to do with the way I am hooking up the sub. Is this a REL sub? You might want to contact them directly for some help. Yes, sir, it is a REL. So i moved to brand new house with a good new eletric system, in the kitchen we have a microwave, a refrigerator, one transformer 220 to 110 from a water purifier from our old house wich was 110v this new house has 220V. In my room theres only an air conditioner most of the time turned of, and 2 voltage plugs, when i connect just my sansui (wich in the old house i had only on plug of 220v wich i used for the sansui) i can hear a 120hz ground loop hum, even when i disconnect the ground from my sansui the hum still persists, i checked the voltage F N = 215V N GROUND = 0.3 F Ground = 214V , so i assume the energy is correct. im trying to figure out how to solve this problem. With the ground or without the ground the hum persists its not a 60hz hum its a ground loop hum 120hz. Tried to hook the marantz and the problem still going on on the marantz 2220(even louder) . In my old house both receivers didnt get any hum. I would like some help im going to contact an eletricician this week, and would like a starting point on how to solve this since i live in Brazil and we got to know everything that going on to the service be well done. Thanks all!! People i tracked the problem, the problem is not the eletric circuit in my house but my PC, i decided to change the receivers to another room and for my surprise no hum! , then i conected again in my room and no hum again! but when i plugged my PC connected my dac on rca cables to the receiver for my surprise lots o hum, i decided to conct a plug with no ground in my pc and for my surprise hum goes away, but when i disconect my pc from the plug and conect direct in my house(with ground) theres hum, the ground wire is somehow giving hum to my PC, but i suspect the problem is not my ground because when i use the multimeter in my house there no eletricity in the ground, but when i plug the pc with the ground plug theres noise, removing just the ground plug no noise. the problem wa si was grounding my vintage receivers with the ground conector on them, i grounde dmy pc again and remove the ground from vintage ones problem solved. I’m having a problem at my music studio. I’m hearing radio interference in my speakers and through my microphone. I’ve tried to isolate each outlet and it doesn’t change. I as well tried to unplug all the audio cables and just leave each power cable in individually and nothing has changed. When I put two hands on the mic shockmount the sound goes away. Also, when I put two hands on the back panel of my speakers the sound goes away as well. I think it’s a grounding issue, but it might apply to the whole room and to my isolation booth. It could be power elsewhere in the building as well. I’m not too sure. Is there anything you suggest in this situation? I’ve got what sounds closest to the 60Hz ground hum. I have traced it to the connection between my Audio Research GS150 preamp unbalanced input to my Marantz sr5013 preamp output. Once I disconnect the preamp cables, the the system goes perfectly quiet, I have the Marantz feeding 5 other speakers and 2 LFE subwoofers, all Vandersteen. I have everything that’s powered (Sub’s and front 2 channels) bonded via the ground post. If I touch the outer metal of the unbalanced cable to the outer input, the hum starts, so it’s clearly on that unbalanced outer jacket. I’ve tried lifting just about every ground, or connecting every ground wire I can think of. I’ve also replaced the electrical wiring feeding the equipment, so there is a single ground point all bonded together. I have also replaced the Preamp cables, but to no avail. The hum does not respond to volume changes to the receiver (the GS150 is set to processor mode, so volume is controlled by the sr5013, and as I bonded more and more items together, the hum volume has reduced. It’s now much quieter than before I bonded everything together. At this point, I’m considering buying a Marantz AV7705 and MM7055 (I can still return my sr5013). That would give me a balanced connection to my preamp, and hopefully remove this horrible hum? I have the PS Audio DirectStream DAC with Bridge II on order through Moon Audio, but that is on back order until May. I’d really like to get this resolved before then, thanks in advance for any help. And I’ll likely still use the GS150 as the preamp, I primarily bought the DAC for Roon transport into my system. Can you give us a call for help? My guess is the Audio Research preamp is the culprit. I would disconnect everything from the Audio Research except its output. If it still causes the system to hum (and there’s absolutely nothing connected to it at all) then two things to consider: put a cheater plug on the Audio Research. If that doesn’t help, then there’s something wrong with the Audio Research. Paul, you have just won a customer for life! Not only did you fix this issue, but responding on a Saturday morning after I had spent 2 long nights working on this was way beyond expected! I forgot I had bonded the GS150 Pre off the ground post when I lifted the ground on the power cable to it. I removed the ground wire to the GS150Pre and then I lifted the ground on the power cable feeding it. The hum is gone! Woo Hoo!!!! Congratulations. What a relief it must be to have that damned hum gone! I have two speakers connected to a 50+ year old Fisher 500 Transistor Series FM receiver. Our whole house 15 Kw generator kicked on for about 3 minutes during the recent bitter cold and snow in Pittsburgh, PA then shut off as soon as the main power from the local utility came back on. The FM receiver went off and back on as would be expected with one glitch. There’s now a constant 60 Hz hum in one speaker (let’s call it speaker #1) and the other (speaker #2) is working just fine. I connected wire from speaker #2 to speaker #1 and speaker #1 works fine. Any suggestions? Is the FM receiver shot, ka-put? There are no other inputs, just the FM receiver. I may just connect both speakers to the same outputs on the back of the receiver. I’ll lose the stereo affect, but at least both speakers will work. Thank you for the diagnostic steps listed above: step #1 – no change in volume; step #2 – hums with all inputs; step #3 – only the speaker wires and AC power supply are connected to the receiver. If I am understanding your troubleshooting methods correctly, you’re suggesting that when you swapped channels the hum moved? That’s a sure indication the hum is coming from the electronics. And, besides, speakers cannot make hum. So, yes, I suspect something went kablooey in your receiver. Thanks for your reply, and lesson learned. I have uninterrupted power supply (UPS) and surge protection on my computer, printer and scanner but not the FM receiver. A little late now, the damage is done; I’ll add the same to the FM receiver to protect what’s still functioning. 1. Unplug the video player power the hum stops. 2. Have the player power on then disconnect the HDMI cable of the video player the hum stops. 3. Have the player power on and the HDMI cable connected but disconnect the front speakers of the system the hum stops. Other speakers do not seem have any impact in the situation. 4. Switch to a different video player it acted the same. 5. Checked on the ground from power source it seems that the system was grounded. What else is connected to the video player? My guess is you might have a cable TV connection somewhere in the system and it’s the likely cause. Nothing is connected to the player but I do have a Comcast set-top box which is connected to the receiver with a HDML cable. Disconnect the coaxial cable to the set-top box stops the hum. The coaxial cable was the problem. I added the suggested isolating transformer which fixed the hum. Paul, thanks again for the tips! You are welcome. It is almost always the case where the incoming cable TV connection causes the hum. This is because the cable TV uses a ground at the street and your home uses a different ground. Hi Paul, Perhaps you have already addressed this question above. I have searched but not exhaustively. What if all three answers to your 3 step questions are no? My 120Hz hum/buzz is present in my Bose amplifier even after I unplug everything but the power and the speaker. In that case the amplifier is at fault. The whole process I described above is how to find and fix ground loop induced hum – which is the biggest and most common culprit for hum. A properly functioning amplifier connected only to a speaker should not hum. It’s only when you tie another piece of gear to it that we can get hum induced via the ground differences. If your amp all by itself and without anything touch its chassis or connectors other than your speakers still hums then you need to haul it to the repair shop or trade it in for a new one. The speaker system has a built-in ‘standby’ mode that kicks in after 2 hours of no signal from either input. When the speaker goes into this standby mode, it starts emitting a distinct whine *similar* to the 120hz sound you’ve posted here. Once I play something on my laptop or ask Alexa to do something, the speaker wakes up and the whine stops. Is this a faulty amplifier? I’m in Ireland where all our equipment uses 3-prong connectors so things ‘should’ be grounded. I purchased a rare amp from the 70s from a friend. After receiving the amp the push button on/off switch needed to be replaced. I replaced the switch with a similar switch and soldered it in the exact configuration as the previous one. After buttoning everything back up there is a loud 120hz ground humm emitting from the amp out to the speakers. I’m not really sure whats going on here. Logically I don’t think a switch could introduce a ground problem even if it is wired incorrectly. I’ve checked over the amp and haven’t discovered anything that came loose when I was taking off the cover. I’m really confused here. Any ideas? It sounds unrelated to the switch installation if it is truly 120Hz hum (use our examples to figure it out). I would suspect a ground loop and you need to just disconnect all input connections to the amp so it is just sitting connected to the speakers with nothing else attached to determine that. Sounds to me like there’s a problem in the amplifier. This does happen and it’s one of the reasons we ask people to do as you have, disconnect the inputs to the amplifier so only the speakers are connected. If there remains a hum then your amplifier needs servicing.